We had a fine sail from Carriacou to Grenada. The wind was abaft the beam, the seas were fairly calm, and once we figured out the how to play the current we made good time. The wind usually dies on the leeward side of Grenada, but it stayed steady most of the way down the island. We had to motor a few miles past St. George, but the wind filled in at the lower half of the bay. We rounded Point Salines and got the wind and current right on the nose, so we motor-sailed and then motored the last few miles to Mt. Hartman Bay. The trip ends by keeping Prickly Point to port and then entering Mt. Hartman Bay. As you can see from the picture, Mt. Hartman Bay is guarded by some reefs, so it takes a bit of concentration on the chart, GPS, and water to find the way in. Once we had the course figured out I was free to really look into the bay. It was filled with boats! I later counted over 75 boats anchored or moored and another ten or so in Secret Harbour Marina. This is at least twice as many as there were during our last visit in 2012 and probably three times more boats in the bay than during our first visit in 2010. We worked our way through the boats and amazingly found a place to anchor in our favorite part of the bay. We put away sailing gear and got out our anchorage gear and finally relaxed and looked around. We recognized quite a few boats, but we realized that most of the boats in the bay appeared to be closed up. We spotted people on only three other boats! We began to feel like we were in a Stephen King movie. The next day was Friday and we dinghied in to the marina to catch the shopping bus. We found that there were more people on their boats than we thought. Returning to an island is fun because you get to see friends and familiar places. This is especially true of Grenada, because we have spent so much time there. It’s also interesting to see what’s changed and this was a year of big changes. We already knew that Da Big Fish restaurant had closed but what we didn’t know was that is was being remodeled and planned to open at the beginning of August as The Timbers. It would be a more upscale restaurant managed by the same fellow who runs The Tiki Bar at Prickly Bay Marina. Da Big Fish was a bit out of the way for us to visit it on a regular basis, but we did go there once in a while by bus for special occassions. We look forward to seeing what it is like when we get back. The other big change was that Clarks Court Bay Marina was closing. Bob, the owner, couldn’t quite make it financially and had to sell. It will reopen as a boat yard and marina and the project was well underway when we left. The marina closing was sad news. It was about a ten minute dinghy ride from Mt. Hartman Bay so we went there most wednesday nights for burgers and music and at other times for special events like cruiser cricket matches. We attended the last Burger Night, saw usual crowd, and listened to Gylfie and Jomo play all the regular tunes and accompany Bob as he sang one for the crowd. We saw the last burger come off the grill. It was the end of an era. The last two burgers served, and the grill closed. Bob does one last Burger Night song. But there was still hope. The center of activity was The Oasis Bar in the middle of the marina, but it didn’t fit into the new owner’s vision. Bob devised a plan to pick up the Oasis with cranes, place it on floating pontoons, and move it to a new location. It all sounded improbable, but steel braces were installed and cranes were scheduled. On the appointed day, the crowd grew. Bar Zero was opened in the building next to the Oasis. It was dubbed Bar Zero, because when it opened there was zero alcohol available, but that was soon remedied – after all, Bob had to pay for the cranes. 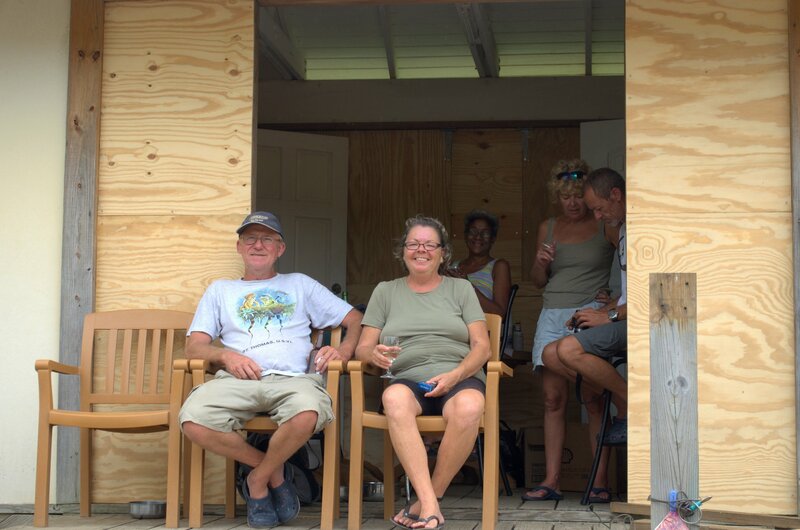 But in typical Caribbean fashion the second crane was a day late arriving, but that gave Bob a second day to sell beer and wine to the assembled masses (and they said he wasn’t a shrewed business man). Finally the moment came and the cranes lifted the Oasis, swung it mostly over the pontoons and set it down. Then the cranes had to repostion, reattach to the bracing, and finish putting the Oasis on the raft. The hardest part of the process was getting the building positioned properly, but Bob and the crane crews persevered. The oasis is placed on the floating dock in two separate lifts. But were will Bob go with the Oasis? No one seems to know. Last we saw it was attached to the mangroves just north of the marina. 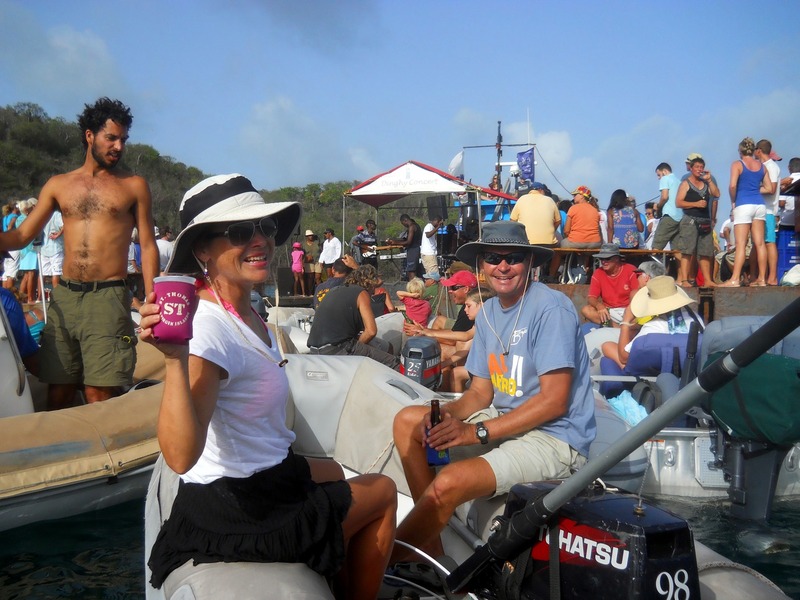 Shortly after we arrived in Grenada Le Phare Bleu hosted another dinghy concert. The concerts have moved from the middle of Clarks Court Bay to just off Le Phare Bleu Marina. The concerts are free, but the new (to us) venue encourages people to spend a little time and money at Le Phare Blue and shortens their shuttle service considerably. The only real downside is that Le Phare Bleu Bay is pretty rolly and makes it hard to dance in your dinghy. 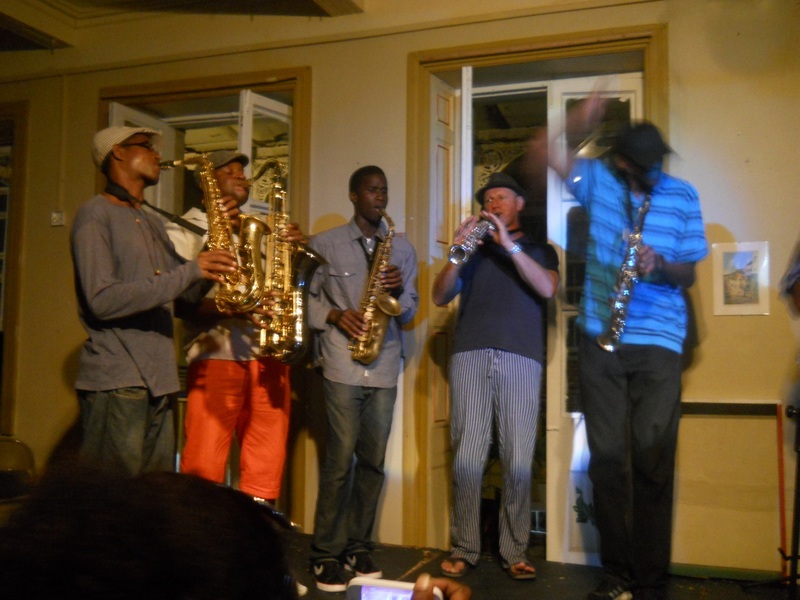 The museum in St. George’s continues to sponser jazz and poetry every first Friday of the month. We went to the event in July and it was great, as is usually the case. We also met a guy who plays local drums and he put us on the track that eventually led us to Monty, a drum instructor. 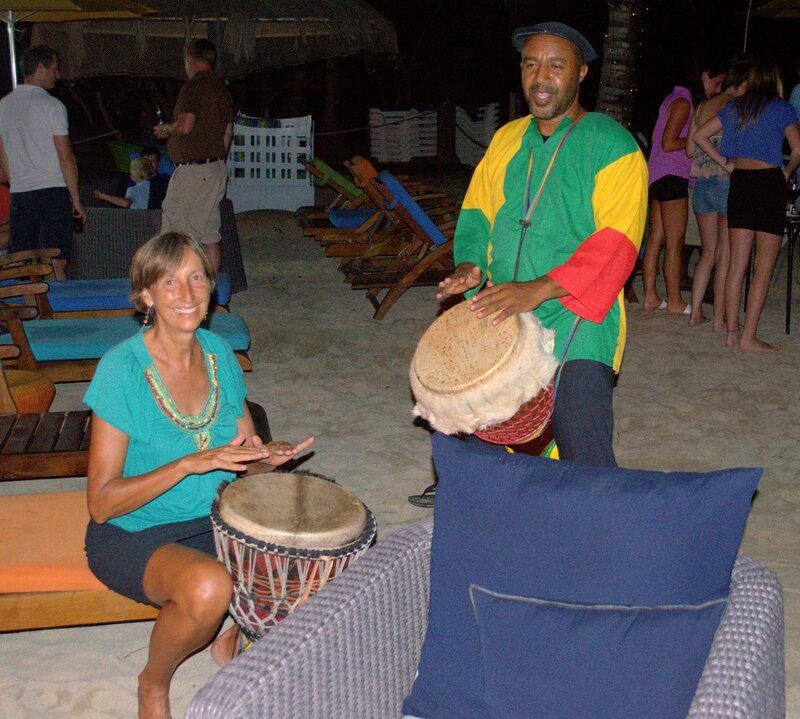 Soon Jackie organized drum lessons at Secret Harbour Marina that were so well received that she had to arrange for two sessions – one for new drummers and one for more experienced drummers. 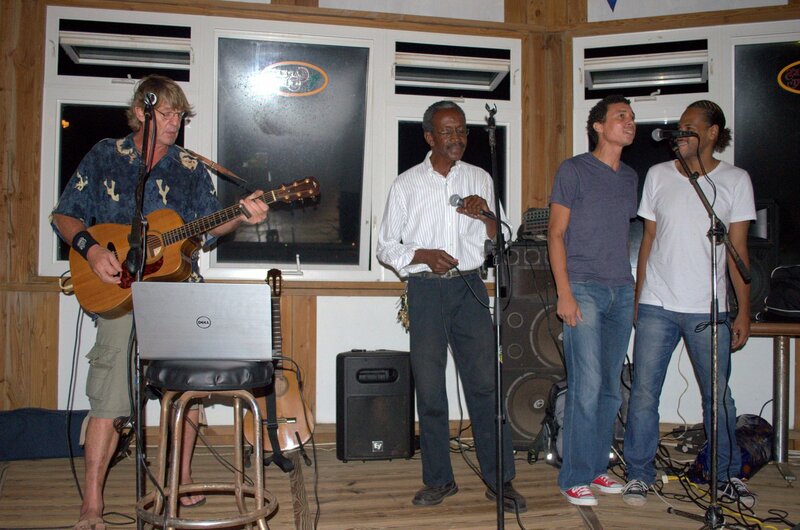 One Friday night Monty had a gig at a hotel on the beach and we attended along with our friends Hal and Inga. It was a low key event with Monty talking with guests and drumming. He had a friend who was supposed to play with him, but didn’t show up, so he invited Jackie to join him. They put on a nice show. While we are not excited about moorings filling anchorages, they do make sense when you put them in spots between existing moorings that are too close together to allow anchoring. Our friend George has some of the moorings in Mt. Hartman Bay. He and his son squeezed in a couple more while we were there. The mooring anchor is a large concrete block with loops of steel sticking out. He makes them at his home and has a crane truck pick them up and bring them to the bay. The block has four 55 gallon drums and many fenders attached so that it will float when launched by the crane. Once launched, George and his son Aaron tow the mooring to the selected spot. Once in place, George puts on his scuba gear, gets in the water, and carefully starts cutting away the floats one at a time. The first to go are the 55 gallon drums. The mooring sinks deeper as George cuts away each drum. The drums pop to the surface in dramatic fashion. 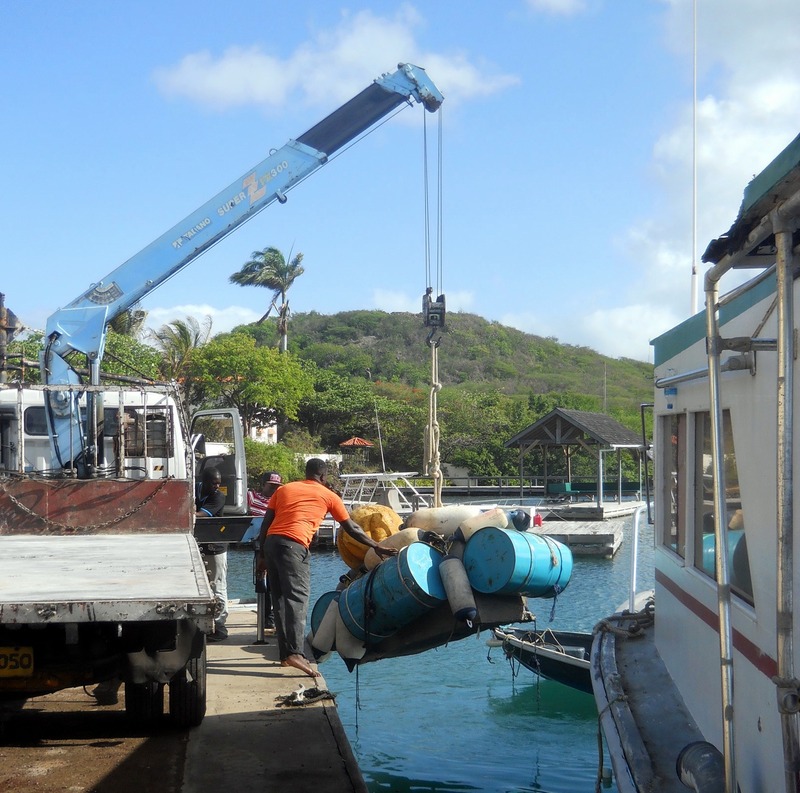 As George releases the floats, Aaron collects them and loads them into the spare dinghy. Finally George cuts away the fenders and then brings the new mooring line to the surface. It’s a low tech process, but it works quite well. You are currently browsing the The Adventures of Little Rosie blog archives for September, 2014.